As much fun as I have knitting on Hun, and as much as I really want to finish it with every possible bit of speed I can muster, I took a break from it yesterday. Recall the great no knittig winter of 2017-2018? I didn't want to go there again. If my hand feels tired, I rest it. That doesn't mean I did not knit. Instead of a heavy sweater that requires thinking, I opted for socks. 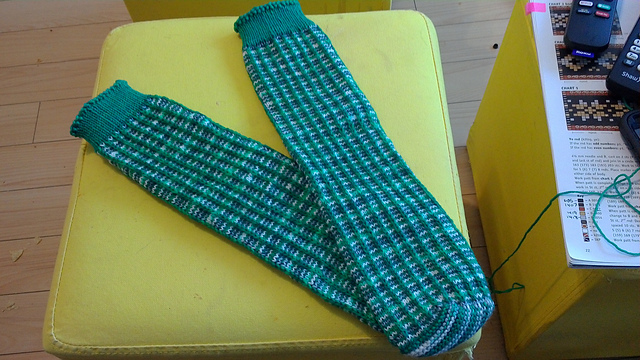 I finished the Gridiron Socks! Look at those strong green lines running all the way up. Cute, isn't it? It was a lot of fun to knit and clever to boot. It was just an all around enjoyable knit. And lots of yarn left over. From midway through sock one, my goal has been to knit a pair of wrist warmers in the same sort of design, that are something mom might wear. It is such a lovely soft yarn, one I would use it for baby things and it will certainly be fine enough for moms hands. I did talk with RCY to see if they had a wrist warmer pattern upcoming, and they are working on it, but the yarn presents some difficulty. And I understand why. A wrist warmer has either a gusset for a thumb or a slit, and both of those things will change what the yarn is going to do dramatically. I do see some flaws in my plan but I still have an out. If I can't figure out something for a wrist warmer, there is lots here for a sock yarn hat. Ribbing of solid green and body of the hat with a variation on the theme for the hat? Maybe even a pompon? And in other knitting news, with the cold, I haven't been out for a few days. The landlord picked up the mail and brought me yarn for Emmett's scarf and knitting it has commenced. It also brought a little bit of sock yarn, but we won't talk about that to much because I already had enough sock yarn. But still. When I was a kid one of my earliest memories of grandmas house was of all the aunties getting together to make wool quilts. My Uncle took off the table top and set up the quilt frame somehow on the table legs. We kids would sit under the table and watched the needles go through, and the hands turning moving swiftly along. Seeing a quilt being made from the underside is not something you forget. Sleeping under something that you saw being made right from the carding of the wool is not something you forget either. My Auntie Lorraine who loved to embroider and crochet taught my sister and I outline stitch embroidery for tea towels, pillow cases, and dresser scarves. There were always crocheted doilies and antimacassars at her house too. I have been fascinated by needle and threads since then. 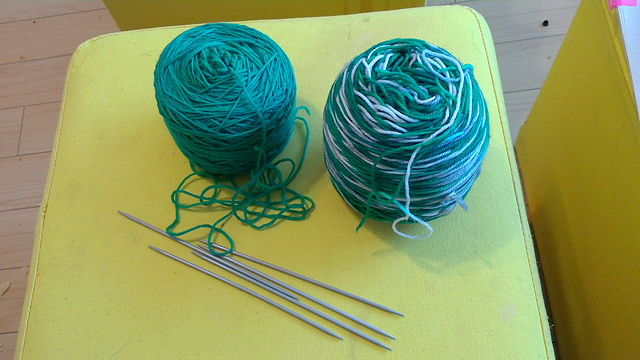 I can't pick a favourite among string and needle things. I sew, do crosstitch, needlepoint, hardanger, blackwork, and embroideries of all kinds. I crochet and tat, and now I knit too. Did I leave anything out? Tell me. I'll probably need to learn that too. It's a compulsion. And now I spin. Did I mention I have a small loom? And now a much bigger loom? Like I said, this is clearly a compulsion.